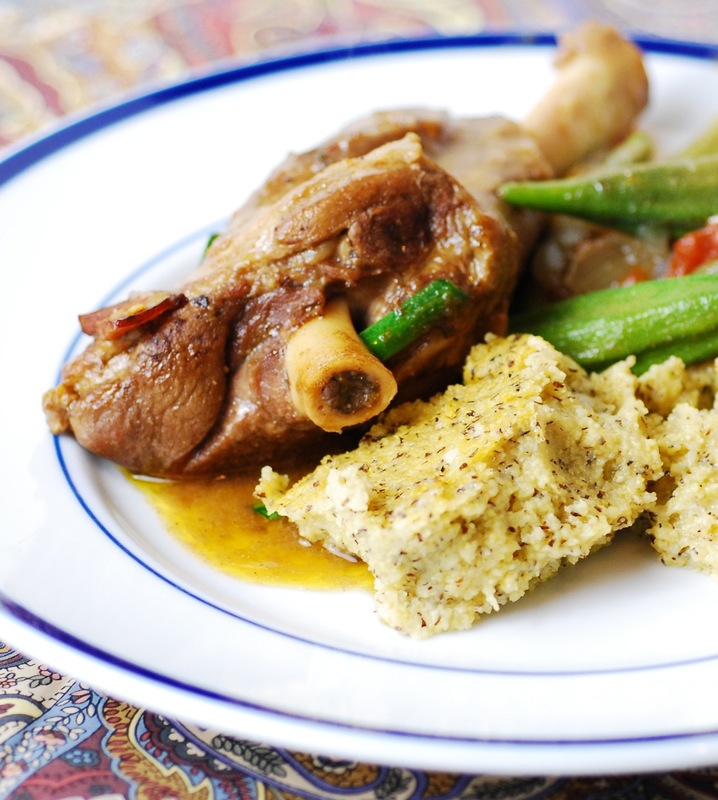 Local Vermont lamb shanks are a wonderful spring dish, and a balti-seasoned braise paired with Taragna polenta makes these shanks wonderfully different. It's been a cold spring up here lately; 30 degrees this morning! 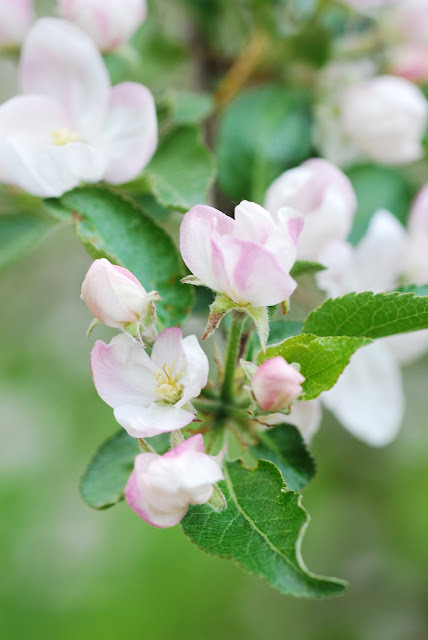 Some of the plants I've been buying for the garden seem to be in peril, and I've been moving them indoors. The cantaloupe seedlings look like they want to go back underground. The tree peony looks lovely in my bedroom, but it was supposed to be out in the garden. But buck up, I told myself. Just make something hearty for dinner, and things will shape up; it's sure to be warmer tomorrow. I recalled that we still have most of a local lamb in the freezer. As usual, there is pressure to make space for the next thing, which is a local goat. Until space is cleared, the goat is in Lisa's freezer. So I decided to make lamb shanks, and to use some nice things I've been accumulating: Taragna polenta, which is a mixture of corn meal and buckwheat flour, and Balti seasoning from Penzeys Spices, which is a great blend of spices you have and some you probably don't. 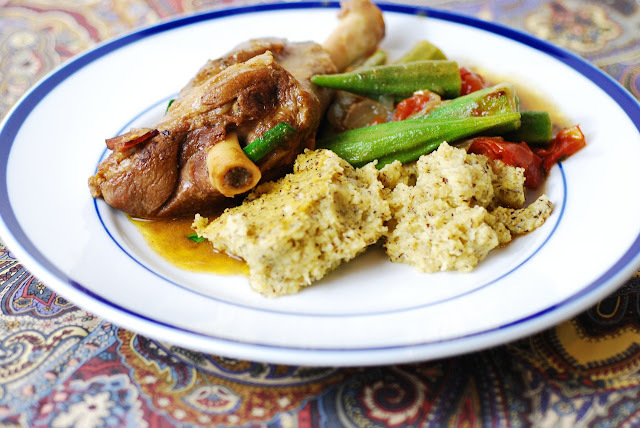 * I also had some crisp okra, chinese chives and ripe plum tomatoes, so I was good to go. The recipe only calls for half of the Wolaver's. You'll have to figure out what to do with the rest. It's very warming. * From Penzeys: Balti is "Hand-mixed from: coriander, garlic, ginger, cumin, dundicut chilies, Ceylon cinnamon, brown mustard seeds, cardamom, clove, fennel, fenugreek, charnushka (kalonji, black onion seed), ajwain, star anise, black cardamom, cilantro, anise seed and bay leaf." 1. 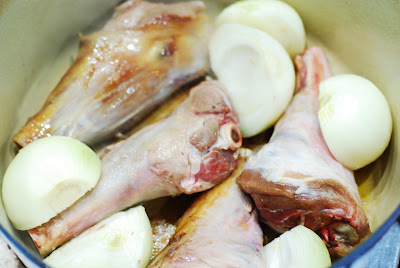 In a large, lidded braising dish, brown the shanks in the olive oil, adding in the onions after two minutes. Add the lardons. Continue browning for 5 minutes, or until browned on most sides. 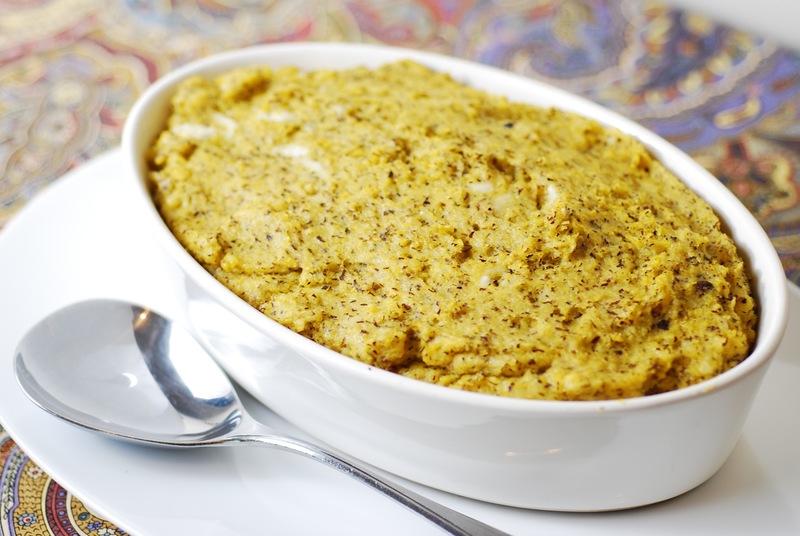 If you are using curry leaf powder, add it during the last minute of browning, and let it sizzle in the olive oil. 2. Add the chicken stock and the Balti seasoning; mix in. Add the Stout, bay leaves, 1 tsp salt, and a few grinds of pepper. Place the split tomatoes on top, do not mix in. 3. Put the lid on the braising dish and place in hot (400F) oven. Braise for 1 1/4 hours, or until meat is quite tender. Place on stovetop burner, on low heat. 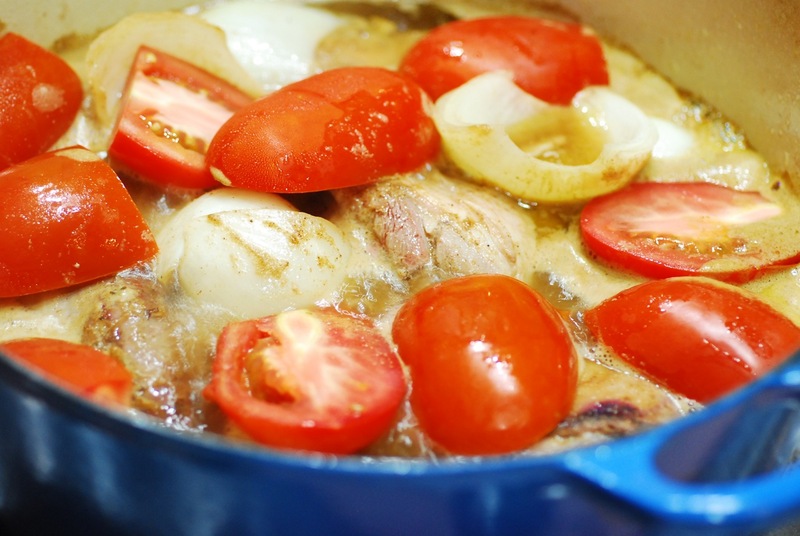 With the sauce bubbling, thicken it slightly by stirring in 2 T corn starch dissolved in 3 T cool water. 4. 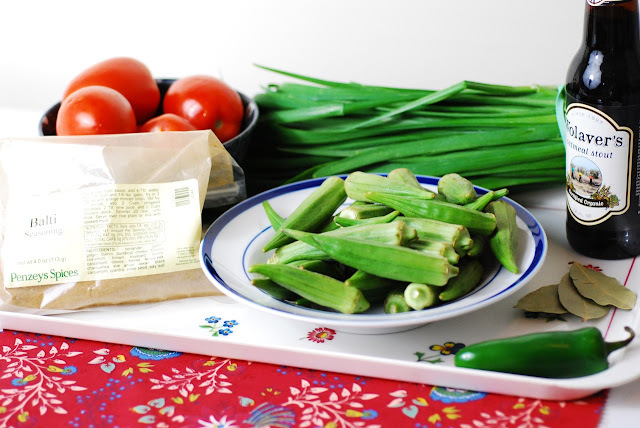 Add the okra and chinese chives. Adjust seasoning with either more Balti, or the optional Jalapeno. 5. 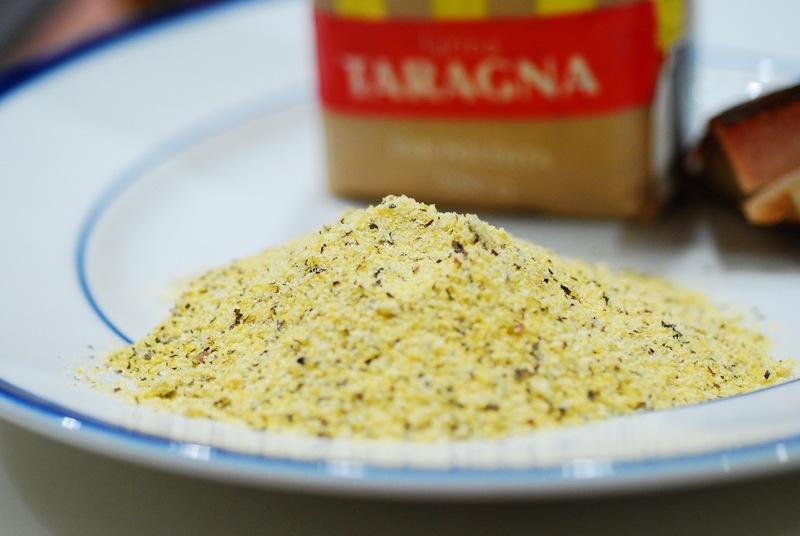 Simmer another 5 minutes and serve with Taragna Polenta. Enjoy! This is a simple but very delicious dish. The buckwheat flour lends a delicate, nutty flavor to the polenta, somewhat like wild rice. 1. In a saucepan, boil the water, stock, and salt, and then whisk in the Polenta. Whisk vigorously to avoid clumping. Add the bacon end slices (optional). If the polenta is too thick, add enough water to relax the mixture and permit it to continue simmering. 2. Continue cooking for 12 minutes, stirring frequently to avoid scorching. If the mixture thickens too much, add a bit more water. 3. Stir in the butter, then stir in the shredded cheese, and adjust seasoning with salt or pepper. Transfer to a baking dish sprayed with cooking spray, and place in hot (400F) oven for 15 minutes. 4. 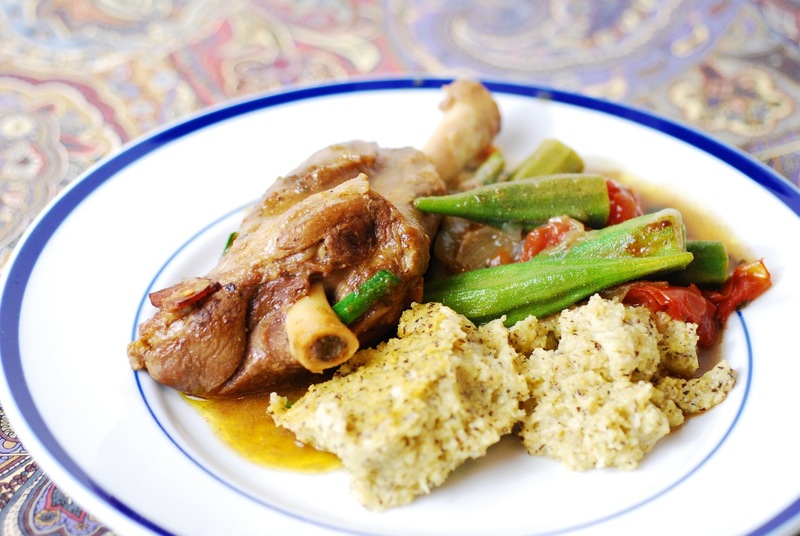 Serve with Balti Lamb Shanks and enjoy!